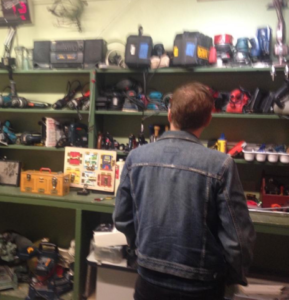 What kinds of tools will Ballard Tool Library (BTL) have? Whatever you need! We use a very loose definition of “tool,” therefore our members can expect to find the usual drills, saws, etc. as well as sewing machines, juicers, canopies, lawn aerators, and many other dealy-bobs and whatchamacallits! We aim to build a collection that represents Ballard artists, craftspeople, gardeners, mariners, and putterers. Are you looking for a specific dealy-bob or whatchamacallit? Let us know and we’ll try to get it! Easy! Just drop in during any of our open hours, sign our waiver and you can start borrowing tools right away! You’ll need an annual membership to Sustainable Ballard ($35 Individual, $60 Household, or $100 Sustaining). Then we ask for a donation of $1-$10 per tool per week. Low to no cost options are available for those with limited income. Set up your tool library membership now. Tool Library Volunteers come in all shapes and sizes! Find your niche as a Tool Librarian, an Outreach Volunteer, a Tool Maintenance Volunteer, a Repair Specialist, Lead a Workshop or join our CraftsmanCorps offering advice in your specialty to novice Library members. Contact our Tool Library Manager and let him know what interests you! Get in the loop and help with planning by joining our discussions in our Google Group. Like our Facebook Page to stay up to date with our current activities. Support the Ballard Tool Library by making a tool donation during our open hours or by making a $5 or $500 donation (or anything in between) to Sustainable Ballard. Please note that you would like your funds to support the Ballard Tool Library.